Have you noticed the difference between the catfish and the rest of the varieties your fish monger is selling? For one, catfish got whiskers, like that of a cat - and they don't have scales -- instead they have mucus-like skin that's very slimy. They have chemoreceptors all over their bodies, which means they taste anything they touch and smell whatever chemical is in the water. This is precisely why sometimes your catfish taste like putik or mud, some taste like pesticide. So it is important to always buy them from a reputable source. 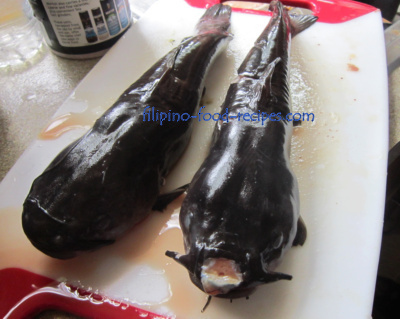 Catfish back in my hometown, Malabon, were sold alive by peddlers. They say that's the best gauge for freshness. True, but if you are squeamish in the handling of these squirmy creatures, I have some tips for you. I've seen some inhumane ways of killing Hito -- I know, you will say it will eventually end up in the pan, so why bother? Unlike most fish that couldn't survive when taken out of the water, the catfish thrive longer so if you are in a rush to cook your live hito, what are your options? Just like live crabs and lobsters, freezing it alive will put it to sleep, but there is an easier way to do it. Put them in a deep container and generously sprinkle with salt until they stop wriggling. Now, how to remove the mucus-like, slimy feel on the skin? Again, use salt to rub all over the skin, then rinse. Repeat rubbing with salt until the skin is totally mucus-free. If there is a funky smell in the fish : Rub with both vinegar and salt, then rinse thoroughly with lukewarm water. Your catfish is ready for filleting or for cooking.